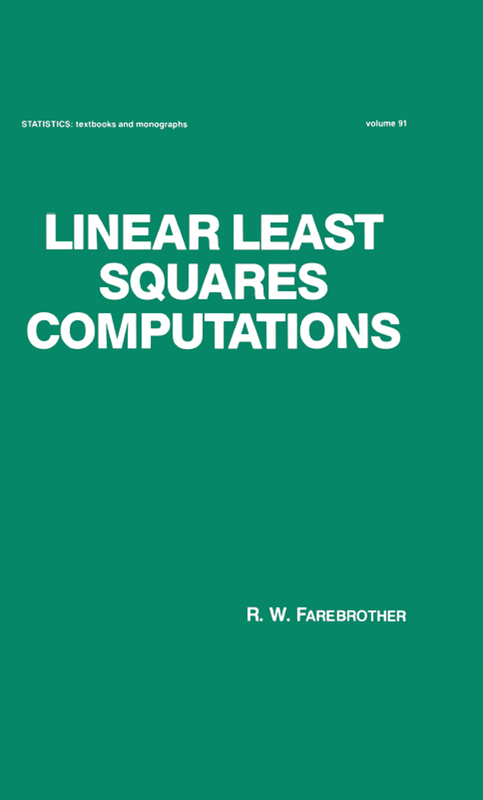 Presenting numerous algorithms in a simple algebraic form so that the reader can easilytranslate them into any computer language, this volume gives details of several methodsfor obtaining accurate least squares estimates. It explains how these estimates may beupdated as new information becomes available and how to test linear hypotheses.Linear Least Squares Computations features many structured exercises that guidethe reader through the available algorithms, plus a glossary of commonly used terms anda bibliography of supplementary reading … collects "ancient" and modem results onlinear least squares computations in a convenient single source . . . develops the necessarymatrix algebra in the context of multivariate statistics . .. only makes peripheral use ofconcepts such as eigenvalues and partial differentiation .. . interprets canonical formsemployed in computation … discusses many variants of the Gauss, Laplace-Schmidt,Givens, and Householder algorithms … and uses an empirical approach for the appraisalof algorithms.Linear Least Squares Computations serves as an outstanding reference forindustrial and applied mathematicians, statisticians, and econometricians, as well as atext for advanced undergraduate and graduate statistics, mathematics, and econometricscourses in computer programming, linear regression analysis, and applied statistics.